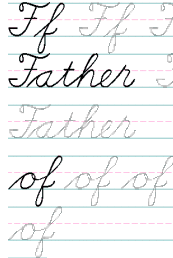 There are 38 cursive handwriting lessons on this page. Each lesson consists of 7 lines for handwriting practice. 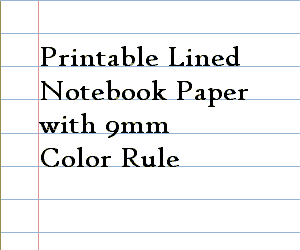 The handwriting rule measures approximately 9mm in height or just under 3/8 inch. Each printed file contains 2 lessons. The lessons are in color, but can be printed in grayscale if you set the print function to do so. The worksheets are in two groups - "All Tracing" and "Less Tracing". The words and letters are "faded" on the "All Tracing" lessons so that your children can trace them. The "Less Tracing" lessons will have blank spaces for your children to write the words on their own. I made these cursive handwriting practice sheets with the letter style shown in the images below. Below, the 6 printable files containing the 12 cursive handwriting lessons with the letters and words that are all tracing. If you missed the information about that, all tracing means that every letter is to be traced by the student. 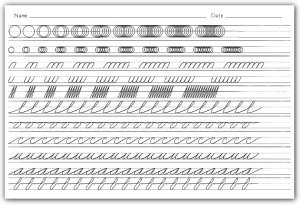 Below, the 13 printable files containing the "Less Tracing" 26 cursive handwriting lessons. If you missed the information about that, less tracing means that while the lessons will contain letters and words that should be traced, there will be blank areas onto which the student will write the letters and words on their own. Lesson 2 - Similar to cursive warmup, letter a is joined to itself, letter m, and letterc. Lesson 2 - Uppercase D is practised with mid-drop and lowest drop to connect to letters. Below are two Lesson Paper files that are designed for two lessons. Lesson paper means that I've included areas for the student to write information such as name and date. Occasionally lesson paper will include an image of manuscript or cursive letters. The rule height is the same as the handwriting lessons that are on this page. See Paper for more choices in blank handwriting paper. Note, One and Two are the same except that sheet two has more "try on your own" space. More Content in the Style "Cursive Z"
See pages:Connecting Cursive Capitals and Practice Writing Words in Cursive Handwriting. The cursive animations that begin on this page Donna Young's Cursive Animations are also "Cursive Z." You might also want to look at my ZB Cursive Handwriting Lessons. Bear-in-a-Bag Christmas Ornament - Cute little bear head sticking out of a bag.